There aren't a whole lot of restaurants open on Sunday in Jacksonville. Most are chain operations. 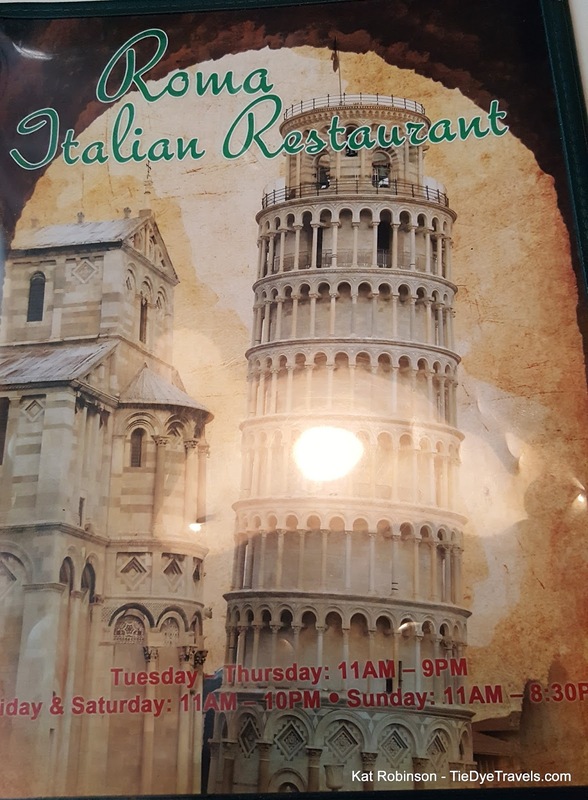 I was thrilled to find a place for us to dine this most recent Sunday, especially with some places closing up shop for the July 4th weekend. That place, if the title of this piece hadn't already told you, is Roma Italian Restaurant. We arrived early in the evening and were quickly ushered to a booth. There were a couple of other families there but that didn't seem to affect our speed of service. 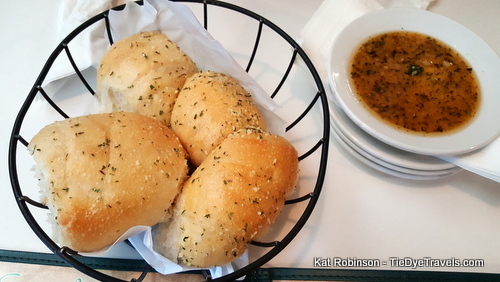 Our waitress quickly brought us buttery, Parmesan-topped rolls with a garlicky pesto and oil dipping sauce. We weren't as quick on figuring out the menu. It goes on for a long time. 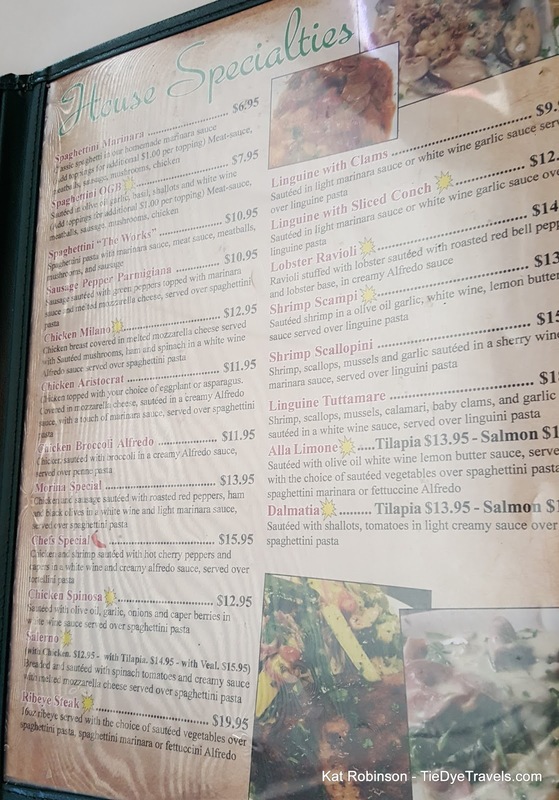 The house specialties take up two pages, which can be a little overwhelming. 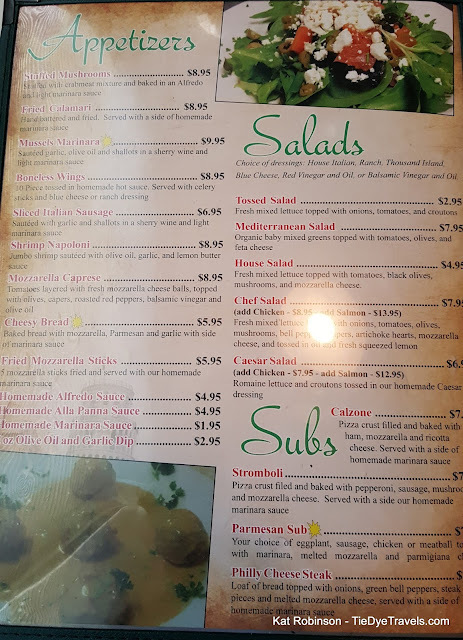 But within that menu, there were all sorts of combinations to try. I dithered over my choices, wondering if I'd prefer the Albanese with its sauteed spinach, roasted red bell peppers and artichokes in a white wine Alfredo or the veritable garden of a Capelini with zucchini and squash, onions and bell peppers, capers, olives, garlic, artichoke hearts, tomatoes, mushrooms, garlic and broccoli in a white wine sauce. My mom was having the same issue. 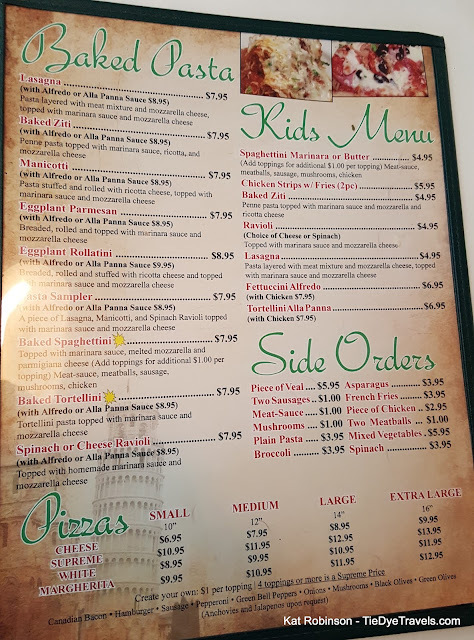 Hunter, on the other hand, opened the menu, decided on spaghetti and meatballs and closed it almost immediately. 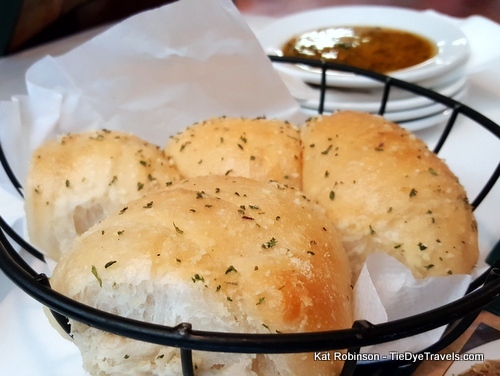 Once we did order, we sat and chatted and tore at the rolls, which were absolutely delectable. At one point, my mom looked up and commented on the enormous platter of food that was directed for another table. Well, we were about to get our own. Our waitress needed assistance bringing out our three plates. Hunter's spaghetti and meatballs were more than I 'd normally eat in a sitting, a huge pasta plate of spaghettini (a rather thin spaghetti noodle) topped with a rich but fruity (tomatoes are fruit!) marinara that was strong on the tomatoes and light on the spice. It came with two rather large meatballs. Honestly, if we hadn't received our dishes at the same time, I would have figured she accidentally ended up with an adult portion. 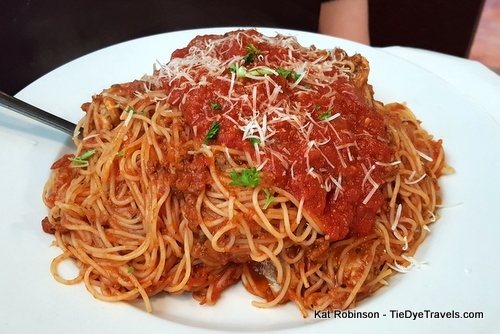 Mom wanted something with a red sauce, and had ended up ordering the Spaghettini "The Works" - which came with meat sauce, meatballs, marinara sauce, mushrooms and sausage. It was an enormous pile of noodles, meat and sauce, a considerable heap of pasta, just stunning. So, we kept joking about the fact that no matter how much she tackled this mound, it never seemed to deplete. She kept finding sausage chunks and meatballs. Me? 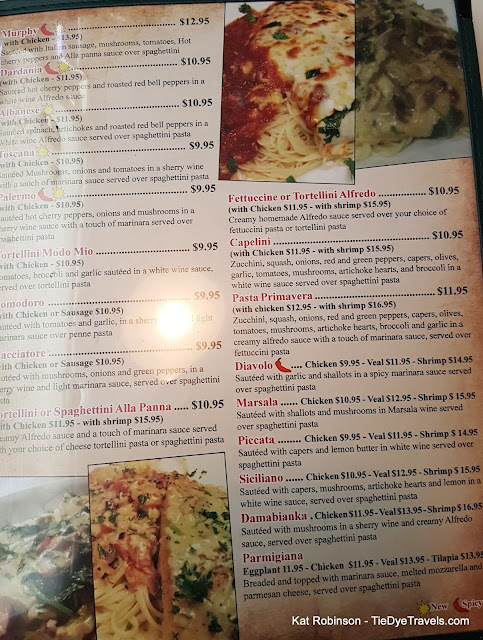 I'd ended up with the Chicken Aristocrat, advertised as chicken and either asparagus or eggplant, topped with Mozzarella and sauteed in Alfredo with a touch of marinara, served over spaghettini (spaghettini seems to be the default noodle at Roma, and it works). What I got was an enormous platter with a wash of orange sauce to the left and a shoe sized cheese-covered boat on the other. Underneath the substantial slab of mozzarella, I found a finely breaded and fried eggplant slice atop an equally flat and pan-fried breast of chicken. We laughed about it, but seriously, all three of us had come in with hearty appetites and we were barely making a dent in this repast. 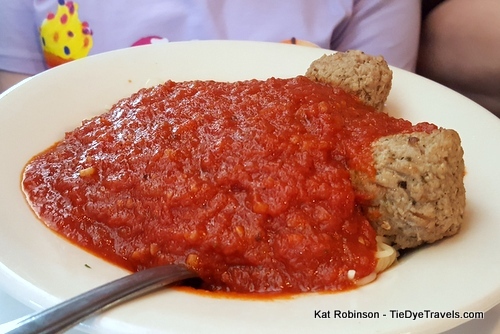 The portions were so substantial, any one of the three (yes, even Hunter's spaghetti and meatballs) could have fed all three of us. The prices weren't bad, either. But I was digging on that sauce. I'm good with Alfredo, but it usually lacks the full note spectrum I want from a meal, which is why I prefer it with a Primavera or similar combination with strongly flavored food elements such as artichokes or roasted tomatoes. 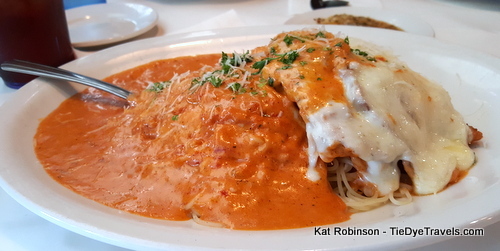 But with the hint of the strongly tomato-racked marinara, the sauce was absolutely perfect. I was even quite pleased with the combination of chicken and eggplant, and even more pleased I could cut through both with the side of my fork. Our waitress seemed to understand our frustration and came over with boxes for us. But we weren't done yet. 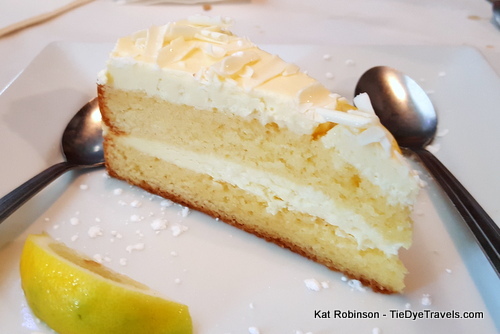 We'd eschewed an appetizer (an Italian restaurant standard including fried calamari, stuffed mushrooms, fried mozzarella sticks, cheesy bread, mussels, shrimp) for a chance at dessert. 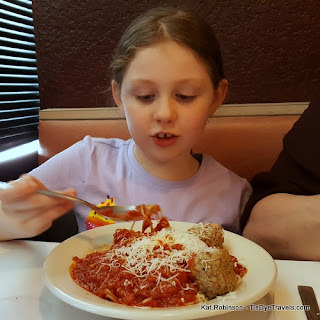 Hunter was all about a spumoni cheesecake, which she cracked us up with her "spew money" insistence on pronunciation. 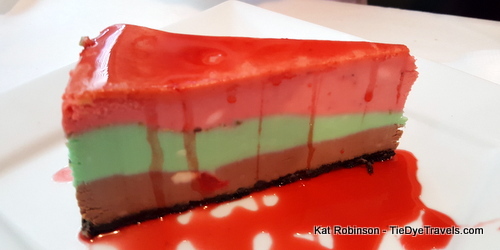 She got hers with a strawberry drizzle, which made it look a little like clown murder, but it was pretty good, just a little strange combining the light flavors of spumoni with cheesecake. Hunter loved it. 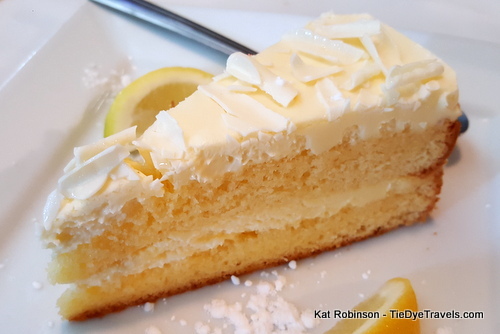 The limoncello cake, though, was perfect - not too sweet, not too heavy, just a light lemon-iced lemon cake. I shouldn't have eaten as much of it as I did, but it was wonderful. 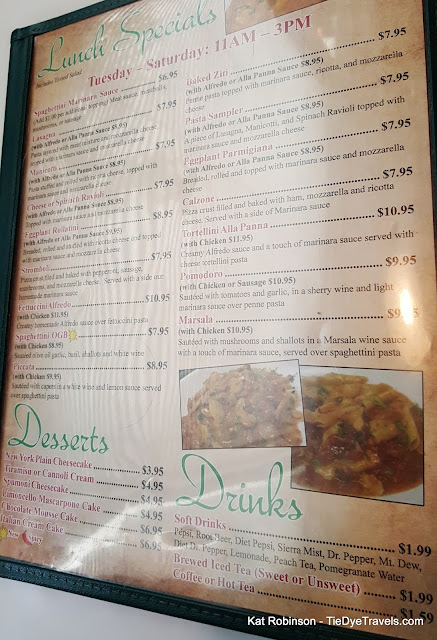 So, Roma Italian Restaurant does have what some might consider to be one setback. Being in Jacksonville proper, there's no alcohol, so you won't be able to have a glass of wine with your dish. But the portions are ample and the flavors are excellent, and I hope it'll survive. You'll find Roma Italian Restaurant at 2006 South Pine in Jacksonville, in the same shopping center as the Cost Plus Furniture Warehouse. It's open Tuesday-Sunday starting at 11 a.m. For more information, call (501) 941-7000 or check out the website. Are they related to the Roma Italian Restaurant in Minden, LA?